Create and manage your own perfect farm. 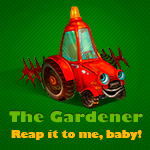 Make friends and build alliances to become the top farmer! Join MocoSpace and you'll be playing The Gardener in no time!